My word but One Deck Dungeon was an unexpected treat. We gave it four stars in our review and the only reason it doesn’t have four and a half is that I am craving ever more quantities of it with ever more ravenous hunger. This is a game I am convinced, with time, will grow into one of my perennial favourites. For now, the adventures are just a little bit too predictable since I’ve been down in that dungeon more than a few times now. They even gave me my own parking spot at the entrance. They misspelled my name, but the gesture was appreciated. What’s not predictable though is where it’s going to fall in our accessibility teardown! Even I don’t know where this sucker is going to land. Let’s don our platemail, pick up our best ‘Sunday go to church’ sword, and start hacking things down until we can see a bit clearer. Colour is a channel of information, but rarely the only one. For all of the skill boxes, an icon is presented along with the colour code for the dice to be used. There’s a disconnect here in that it’s not always clear which of the dice refers to which of the symbols, but this goes away with familiarity. 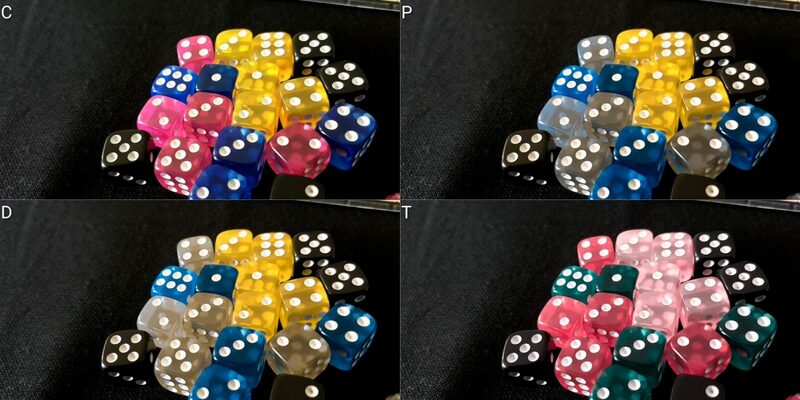 Combat dice and agility dice share a palette when considering Tritanopia, and agility dice and magic dice overlap a smidge when dealing with red-green colour blindness. The icons too are often a little difficult to make out because health and timing implications are overlaid on the top, and often within tight constraints. Green or yellow? Who knows. The dice exhibit fewer problems, largely because of their translucency, but it can on occasion be difficult to make them out in the aggregate. That’s particularly true when dealing with the pink and blue dice with Protanopic sight. Obviously, monochromatic vision would make this all but impossible to do without assistance from someone that could help identify which die belongs to which slot. I suspect that relying on this on a regular basis would make the game all but unplayable. The colour palette as it’s used on the skill cards too adds a very small complication in that the yellow is presented in a way that looks far more like green, and this loses the explicit link between the icon and the colour of the dice. This is an issue that goes away almost instantly, but I did spend a bit of time hunting for green dice in the box. I decided ‘screw it, I’ll use the yellow ones’ only to find that’s what I should have been doing from the start. It’s not at all a problem, but it was an accessibility issue that briefly impacted upon me so I thought I’d moan about it. We’ll recommend One Deck Dungeon in this category but there may be some need for assistance from the table on occasion. It’s not bad as such but the colours used mean there is likely to be an impact on game flow when playing for some players. We have a suite of problems here. The first and most obvious one is that you roll a lot of dice. A lot of dice. They’re six sided, but they have different colour codes that map onto different skills and that’s hugely important for play. The nature of the game mechanics too mean that it’s not straightforward to substitute accessible variants because of the way powers work. You might for example spend a six you rolled on a magic die to turn several dice over to another face. You might cash in two combat dice for an agility die, or three agility dice for a heroic die of a particular value. It’s not as simple as rolling for combat, and then agility, and then magic. The role individual dice take on will change over the course of a single turn and sometimes you’ll be making use of the standard mechanism for cashing in two dice for a single heroic one. 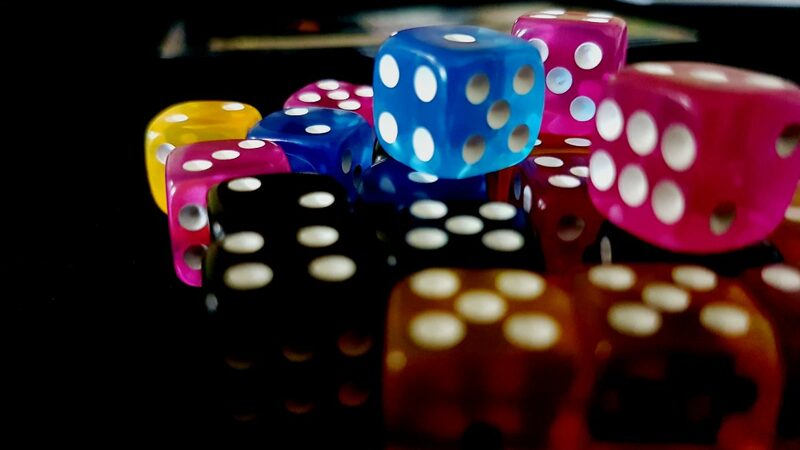 The problem we often encounter in dice games is present here – that is to say, accessible dice are not necessarily a suitable fix – but in a much more intensive format due to the complexity of the dice system and the sheer number you’ll roll. Rolling a dozen or more dice at the end of the game isn’t unlikely and having a five skills with which to modify them is more common than not. The slot that requires the spending of eleven combat is fine – well contrasted with plenty of space around key information. The three next to it though is very information dense – still reasonably well contrasted but the icon is being obscured by the more heavily emphasised hourglass and number. Consider the five magic at the bottom centre though – poor contrast and heavily overlaid. It’s not at all clear for someone with visual impairments, even with an assistive aid, whether that’s a five or a six. Even minor visual impairments can have a major impact there. Added to this is the difficulty on occasion of making out smaller icons since they are often poorly contrasted against the background. 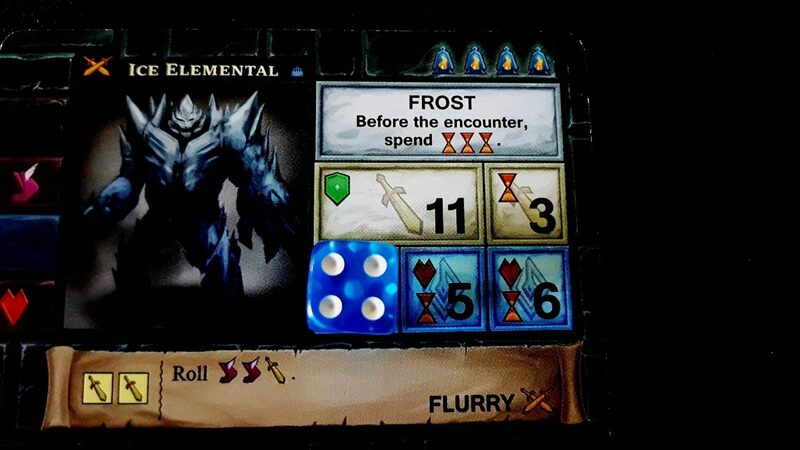 Consider here again the ice elemental – experience tokens along the top right, the combat icon on the bottom right, and even the agility skill on the left all exhibit poor contrast against the backdrop. This is a game with a very dark colour palette, and it has an impact on the visual accessibility across the board. Given how the game is almost entirely one of parsing icons, rolling dice, and then optimally converting and allocating those dice we cannot at all recommend One Deck Dungeon in this category. The cumulative effect of Mana Fountain and Chaotic Aura together grants the ability for a player to passively pick a value of their dice and turn as many of five of them into sixes – for free. The mana fountain feeds the mana into the chaotic aura, and no sacrifice of dice is required. That’s an immensely powerful combination of skills that permits the player to gain considerable traction in even very difficult tasks to follow. Other skills can work together to incredible benefit. Let’s say a player rolled a magic two, a magic one, a combat three, and an agility two. That’s a terrible roll that would have virtually no effect in end-game encounters. That’s where leveraging skills comes in. The ‘Flameweave’ spell permits a player to turn a magic two into a magic five. That magic five, through the Static Burst skill can become a four agility and a four combat. The backstab skill permits the agility two to become a new roll for two combat dice – let’s say a three and a four. The ‘Consistency’ skill then turns all of those dice into fours. So now, the player has a four agility, a four magic, and three four combat. One of those combat dice is discarded to Cleave, which lets the player turn the remaining dice up to fives. And then Brute Force is used to discard all those new fives and turn them into sixes for combat. From the most inauspicious beginnings, the player now has four six combat dice which is likely enough to meet any combat challenge presented by the game. This needs careful selection of skills and ever more careful choice as to how and when they’re used. Combine this with powers available across multiple players and how they intersect, and you have a game of intense and often situational synergy. Memory accessibility is more of a positive story – all of the information you need through play is available with tactile tokens and identifiers, and while knowledge of deck composition can be useful it’s not at all necessary for fun, optimal, or even successful play. The fluid intelligence requirements are considerable but I think there’s perhaps a cognitively accessible variant here in terms of just focusing on picking up ever increasing numbers of dice and rolling them. The skills are important in helping mitigate the randomness of the dice, but sheer quantity of dice is a mitigation all of its own. If players focus advancement only on the picking up of items and experience, then the complexity of the game remains constant. You can house-rule a variant here that perhaps slows down the advancement of difficulty through the dungeon, or permits skills and items to be used interchangeably at level caps. The game then becomes a simpler, but still enjoyable, job of rolling dice and finding the best way to spend them. I would still be wary of offering too strong a recommendation here, but I’d be prepared to do so tentatively provided you’re going to house-rule an accessible variant. There are two primary sources of physical inaccessibility. Unfortunately, they’re also pretty much the only two game systems with which you need to interact. The first is the dice play, and the problems here are the number of dice you roll, and how often, and what you do with them. You roll lots, often, and then have to position them often within very tight constraints on the cards. Technically speaking that latter part is not necessary – you can simply place them anywhere and map them on to the card slots they would occupy. That though adds a not inconsiderable cognitive burden when it comes to calculating optimal placement, validity, and order in which elements must be addressed. Even when it just comes to rolling and using skills, you’ll be constantly swapping dice out and replacing them and collecting them back up to roll them again. You may have a set dice pool at the beginning of each roll, but you’ll need to reconstruct it every time because of how it’s transmuted through skills and expedient cashing in for heroics. When you collect a card you claim it as loot – either experience, skills, items, or in some cases potions. For skills and items you’ll slide them underneath your character to keep on building their capabilities. It’s very easy for this display to get knocked out of alignment which will occasionally cover up items or skills. Again, placing them in this way is convenience rather than necessity but if another system is used the game tends to sprawl considerably – the expectation is this compact representation of advancement is used. You could substitute a notebook or the like for dice, but that adds a job of book-keeping for what is already a malleable, ever changing dice pool system. Verbalisation though is entirely feasible, although I’d contend that in a game like this a lot of the fun is simply in rolling the dice. A fistful of twelve dice shaken and then hurled into a suitable dice tray is a tactile thrill, and you’d lose it by having someone handle that on your behalf. Allocation of dice too is often only experimental until your strategy is locked in, and it can be cumbersome to constantly verbally revise your approach to how your dice should be spent. Often you’re trying to work out a route that permits you to optimally distribute each of these dice to maximum effect – if you were likely to get it right the first time there wouldn’t be much of a game there. Having the physical freedom to allocate and then redistribute dice makes this much easier. We’ll tentatively recommend One Deck Dungeon here. It’s playable, perhaps with support, but if verbalisation is needed I wouldn’t like to recommend it too much given that someone else gets all your fun from rolling the dice. One Deck Dungeon is usually a fair game, but occasionally sets you out with a starting state that is all but unwinnable. Two bad encounters can be enough to end the game for you, and often there will be nothing you can do because the tools for mitigating randomness lie several encounters down the line. By the end of the game you have enough skills and dice that you are likely to be equal to even the stiffest challenges. To begin with you only have the dice and they may not favour you in easy contests, much less the extremely difficult ones. You don’t actually have to attempt a task that you think is impossible, but every time you flee from an encounter it costs the time for the encounter without you achieving anything from it. There’s some ‘give’ in the deadline in that you’re not expected to play entirely optimally before you can progress but you can’t afford too many missteps. After two encounters you should have a skill and an item, or perhaps even levelled up. Ideally you’ll be at full health, but if not you’ll only have taken a few points of damage and maybe lost a little time. If something less positive has happened then you might find when you reach the second level you’re put back in the position of being unable to meet its challenges. Related to this is the fact that sometimes your choices for loot don’t really help you much. It is rare, but entirely possible, to be fully levelled up and still not able to make progress. Reliable advancement through the game is built on being able to make the dice do what you want and if you don’t have the tools for that then there’s not much you can do. If playing in the campaign mode though, there are ways to redress this. 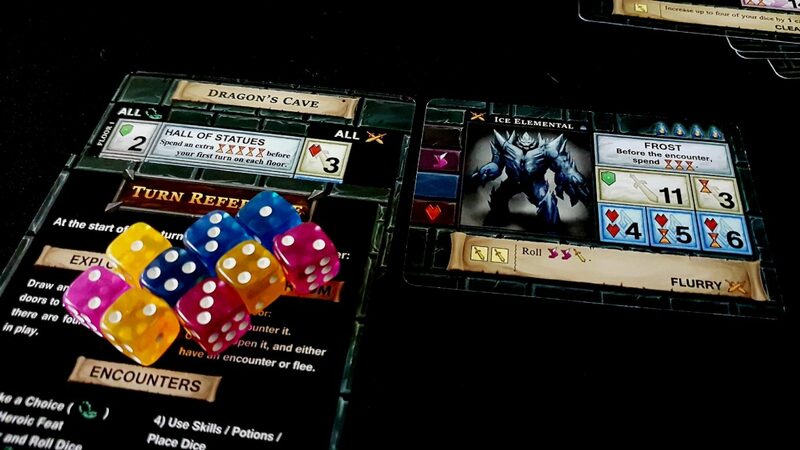 You don’t need to win a dungeon to advance, and the additional bonuses you get from earning a few starter freebies go a long way towards solving some of the problems associated with early risk and dice mitigation. As such, you can gird your loins and accept you might have a tough go of it now but you’ll be in a better position next time. We’ll recommend One Deck Dungeon in this category. I am going to end up hating myself at the end of this section because I’m going to have to make the same argument that I’ve seen so many of the worst voices online make about so many cultural products. So let me start off by saying – I absolutely love, on a personal level, that all the characters in One Deck Dungeon are women. If they were all men, I would have had a little tantrum in this section as is my usual schtick. There is though a difference between an exclusionary technique that favours the dominant expectations of the status quo, and one that explicitly subverts them. One Deck Dungeon does the latter, and I very much like seeing it. There are lots of game where women aren’t represented in any meaningful fashion – this one game doesn’t remotely make a dent in the overall problem of representation in board games, but if it did it would be a dent that was corrective rather than destructive. God, let me get my fedora out and have done with it. This is still an accessibility problem, m’lady, in exactly the same way it would be if the genders were reversed. Having an all-woman cast when looked at the aggregate of all games everywhere is fine. Good, even. However, for this specific game there’s now a scenario where men don’t have a character with which they can personally identify. It would be great if that wasn’t a problem, but it is. If it’s a problem that women often don’t have a character option with which they can identify, and I believe that is a problem, it doesn’t stop being a problem for men just because there are lots of other games out there with all male rosters. If someone wants to play this particular game, and they absolutely should because it’s great, it’s not ideal if they can’t take on a role with which they identify. Games like Imperial Settlers, with reversible character portraits, do a better job with this. I hate to say it, but there’s a point here among all the conspiracy theorising. So that means One Deck Dungeon is simultaneously part of the solution, when viewed as a data point in the industry as a whole, and part of the problem when viewed as an individual component within that industry. I’m not going to treat it as pointedly harshly as I would if the situations were reversed though. Some might call that a double standard, but I think it’s better to think of it as a nuanced standard. Something can be wrong in one context and right in another. The philosophy of representation here is an accessibility problem, but it’s not one that I personally am sorry to see especially when the cast of characters is both respectful in its portrayal and diverse in its ethnicities. I’ve long argued though that it doesn’t matter if an accessibility issue is real or conceptual. Unless you’re going to invest a large degree of your time and energy into convincing people to come around to your point of view, then you have to work within the limitations presented by theirs or accept the consequences of the inaccessibility you have created. At an RRP of around £24, One Deck Dungeon is very pricey for the player count. 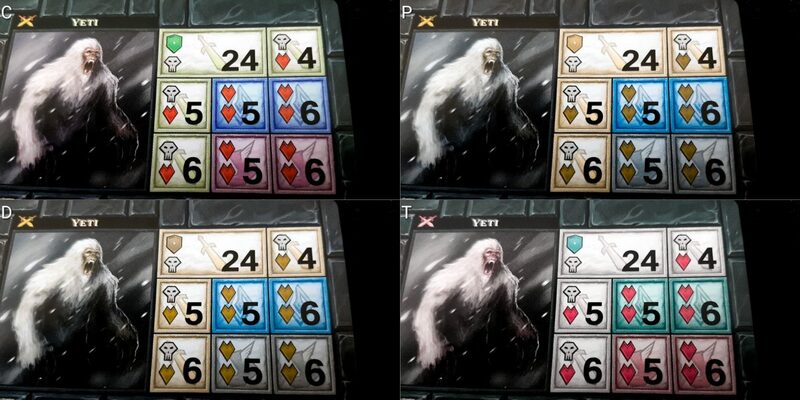 Two players is all you can support in a single box – you need two boxes to go up to a four player game. It’s very good in both one and two player modes but it’s still a questionable value proposition given how samey the encounters get by the time the first dungeon is completed. The different dungeons and bosses add new inflections to everything as the game goes on, but still – if you’ve killed one skeleton, you’ve killed them all. That said, I’ve more than gotten my money’s worth out of it already and I expect to play it many more times in the future. Your mileage will vary, but my mileage has been very good. We’ll recommend One Deck Dungeon here – it’s a very good game even given how repetitious it gets, and I think its approach to diversity is laudable in the abstract even if it’s a problem in the concrete. If playing as a group, a degree of communication and coordination is required, and there is a fairly high level of literacy required to interpret dungeon, skill and monster effects. This is within a non-traditional vocabulary too although such discussion will usually revolve around what skill gets used how and where individual dice should end up going. It doesn’t tend to be intense or highly nuanced. If paying solo, only the literacy requirement is likely to present a barrier here. We’ll recommend One Deck Dungeon here for most players, although would advise those for whom literacy is an issue to avoid it. Given the nature of play and the often fiddly physical interactions required, we’d be inclined to advise those with an intersection of physical and emotional accessibility concerns to avoid the game. It’s difficult enough without having to add the stresses of compensating for the physical accessibility issues to the mix. Similarly, if physical impairments intersect with memory impairments, the compensations we have discussed above will not be appropriate – they rely on sacrificing the memory prompts of the cards and the position of the dice. Other than this, existing recommendation in the various categories would cover the intersections. Play time is reasonably brisk, but play is unusually active – you’re constantly collecting and rolling and placing dice. While this isn’t an inherently tiring activity it’s almost certainly going to involve an unusual amount of exercise due to the way the dice and your dice pool is constantly being adjusted and curated. As such, while play sessions are not long enough to exacerbate issues of discomfort it might be intense enough to do that in some circumstances if physical impairments must be considered. The game doesn’t explicitly permit the ability to drop in and out of play, but there’s nothing to say you can’t simply stop where you are and record whatever progress you achieved. There is a campaign sheet available that offers granular recording of progress based on experience gained, levels defeated, and bosses beaten. As such, you can make use of this and simply start fresh with the dungeon another time without having lost all of your progress. That’s a nice, relatively innovative feature that I think works really well for many complex interaction conditions. 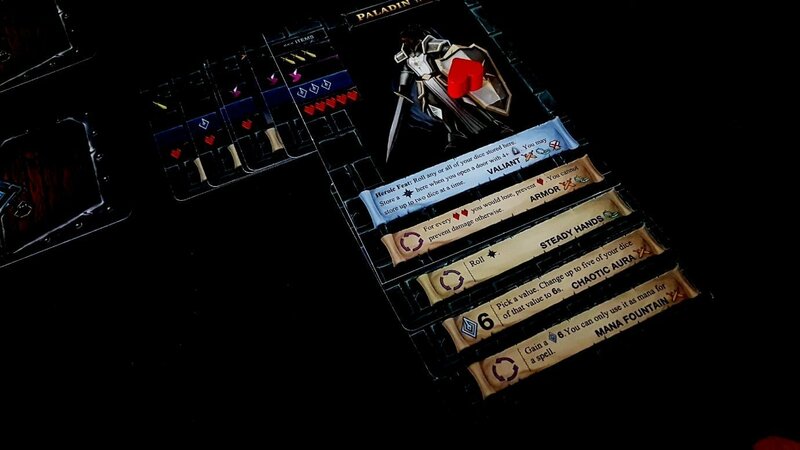 The expectation of a roguelike is that progress within any one adventure is temporary, and this is well implemented within One Deck Dungeon. Well, my guess would be that I manage to upset everyone on both sides of the ‘all women cast’ debate for One Deck Dungeon. I’m often accused of being a rabid Social Justice Warrior by certain segments of the boardgaming community, but that’s always been an accusation driven by ignorance both with regards to the intention of the site as well as the actual content. My own political views are irrelevant here – an accessibility barrier is a barrier regardless of whether I believe it should be. I like the all women roster in One Deck Dungeon. I applaud Asmadi for doing it. Regardless it’s still an accessibility barrier and as such it still gets flagged up here. 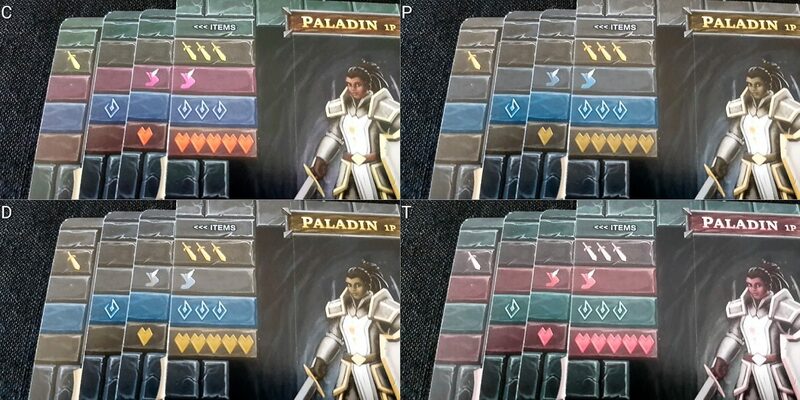 The aesthetic and colour palette of One Deck Dungeon creates a number of problems particularly with regards to visual impairment. Mostly though its inaccessibilities come from the game design itself. Dice, and lots of dice in particular, are a visual accessibility problem across the board and that only intensifies when the placement of dice is a core part of play. Still, it doesn’t come out of this teardown as horribly bruised and bloodied as many other games I otherwise completely love. I’m looking at you, Blood Bowl. We gave One Deck Dungeon four stars in our review, and should more content packs eventually make their way into circulation I would certainly expect that to go up over time. While the dungeon in this box tends to repeat itself like a nervous teacher on the first day of school, it remains fun and interesting even once you’re used to seeing the same old faces float in and out of prominence. If you like the sound of the game, and you think you can play it, I don’t think you’d at all resent your time in its company.